These are found on a separate page. A look at any set of facts about vitamins will tell you that it is very difficult to get all the vitamins and minerals you need from today’s food sources – even if you eat properly, something that most of us do not do. See the page on Food Supply for more information (opens in new window). You’ll find there that we need to take vitamins and minerals in supplement form to maintain health and prevent degenerative diseases. It is very difficult to determine which vitamins and minerals should be included in your daily vitamin supplements unless you are a trained naturopath or equivalent. Vitamin D facts, for example, will be quite interesting. Poor choices can do more harm than good. If you just can't wait until later to learn more about free radicals click here now (opens in new window). 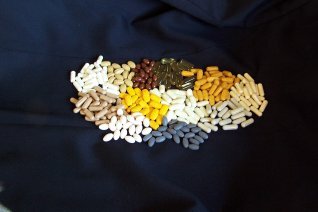 So for most people it is important to choose high quality multivitamin and multi-mineral supplements. WE NEED a complete list of vitamins that includes a cascade or symphony of antioxidants to scavenge free radicals, to prevent cell damage and thus forestall degenerative diseases. To combat the ever increasing oxidation burden that cannot be avoided in today’s world we need an antioxidant TEAM that includes all the established list of vitamin antioxidants, mineral antioxidants and cofactors, flavanoids and other polyphenol antioxidants along with special antioxidants including melatonin (which decreases dramatically as we age), N-acetyl cysteine, L-glutathione , and alpha-lipoic acid. This is an area of some confusion. At present three different terms are in use and eventually one should become common. The RDA, Recommended Dietary (Daily) Allowance were established initially during WWII, and periodically revised by the Food and Nutrition Board. They tend to the low and conservative side and below the level needed for good health and to prevent today’s degenerative diseases. Initially developed for diseases like scurvy, pellagra and rickets they are woefully out of date. They are being upgraded but this only means that, because of our eating choices and problems with the food supply, an even smaller percentage of our population would meet the RDA levels. The RDI, Reference Daily Intake, is the value established by the Food and Drug Administration (FDA) in the USA for use in nutrition labelling. It was based initially on the highest 1968 RDA for each nutrient, to assure that needs were met for all age groups. The DRI, Dietary Reference Intakes, are the most recent set of dietary recommendations established by the Food and Nutrition Board of the Institute of Medicine,1997-2001. They will replace previous RDAs, and may be the basis for eventually updating the RDIs.